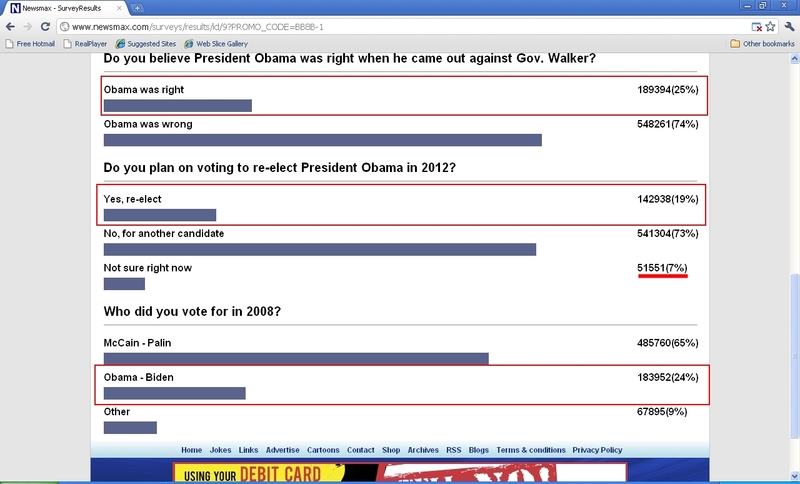 Though this highly biased unscientific poll doesn't prove what Newsmax wishes it would (which is that the entire interwebs believes that Obama and unions are bad) it still provides an interesting modicum of real data points. 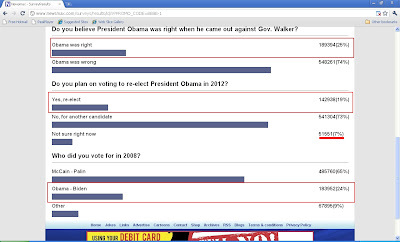 It provides a base of Obama supporters being ~25% of the poll takers that agree with Obama in his criticism of Union buster Wisc. Gov. Scott Walker (R), against stripping individual rights of workers to negotiate in collective bargaining agreements and voted for Obama in 2008, but 6% peel off to committing to re-electing Obama. Though the poll is just of the number of people clicked through an ad and not even indicative that 100s of thousands of individuals since the same people could have just taken the poll over & over. With that caveat, it is significant that 24% of the response that in general were Obama supporters are considering to vote for someone else or stay home on election day.